Centuries-old tradition runs deep in Japan. Customs created over the country’s long history influence all aspects of daily life. One way to immerse yourself in this culture is by spending the night in a ryokan, a traditional Japanese inn. 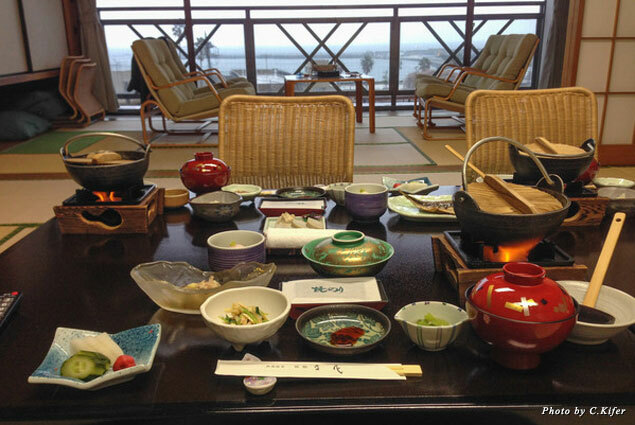 I recently stayed at Ryokan Tachibana in the seaside resort town of Atami and learned a lot about Japanese customs, cuisine, and design. A ryokan is more than just a place to rest your head at night; for Japanese travelers, visits to these traditional inns are an indulgence and a destination in themselves. With long work days and an average one-way daily commute of 90 minutes, weary urbanites flock to these inns when possible to rest and unwind. Ryokans originated in the Edo Period (1603-1808) as guesthouses for domestic travelers. The ryokan experience hasn’t changed much since that time. 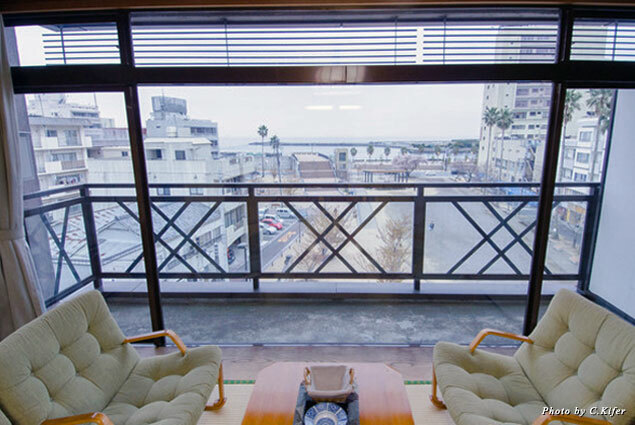 Guest rooms are simply furnished, with tatami (straw) mat rugs, traditional décor, and plush futon beds. 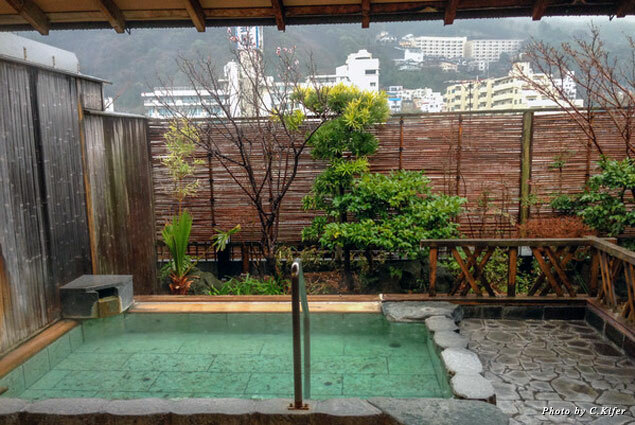 Many ryokans also feature natural hot springs baths called onsen in an indoor/outdoor design landscaped to highlight the natural beauty and views of the area. 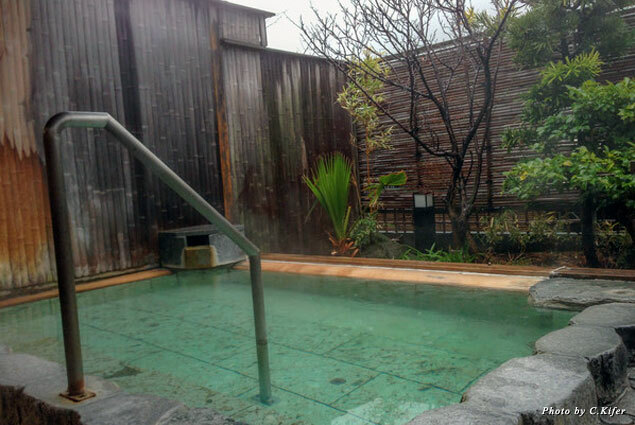 Onsens are believed to have healing powers due to the natural mineral content of the water. 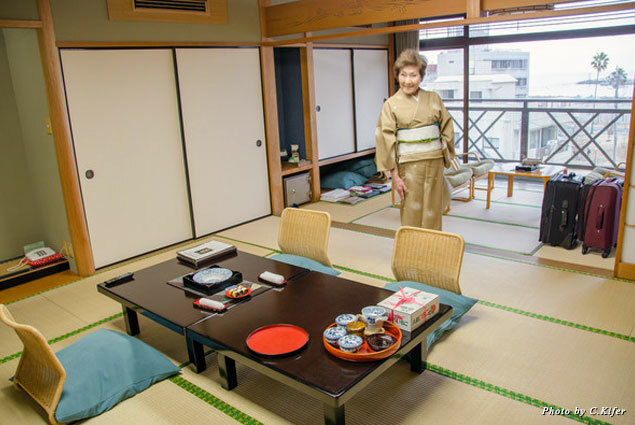 A typical one-night stay in a ryokan will include two traditional multi-course meals served in your room by a private maid: dinner on the night you arrive and breakfast the next morning. The cuisine (called kaiseki) is prepared in a traditional way featuring local dishes and seasonal ingredients and will no doubt be the highlight of your stay. This type of cuisine is so important to Japanese culture that UNESCO, the United Nation’s cultural organization, recently added traditional Japanese cuisine to its Intangible Cultural Heritage list, meaning the preservation of this way of eating is vital to the survival of the traditional culture. It has only been the second national cuisine honored as such, after French cooking. Japanese guests typically bathe in the onsen three times during a one-night stay (once before dinner, once after dinner, and once either before or after breakfast), but sometimes facilities are open 24 hours so you can enjoy them at your leisure. 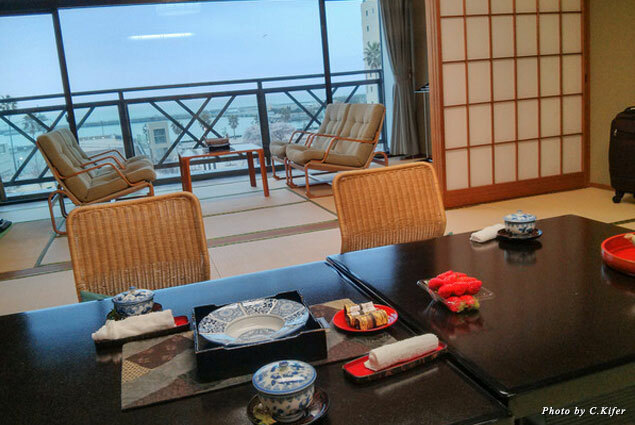 The room rates at Japanese ryokans vary, but they are typically higher than Western-style hotels. Still, locals consider the personalized service, the inclusion of two expertly crafted meals, and this connection with tradition worth the occasional splurge. 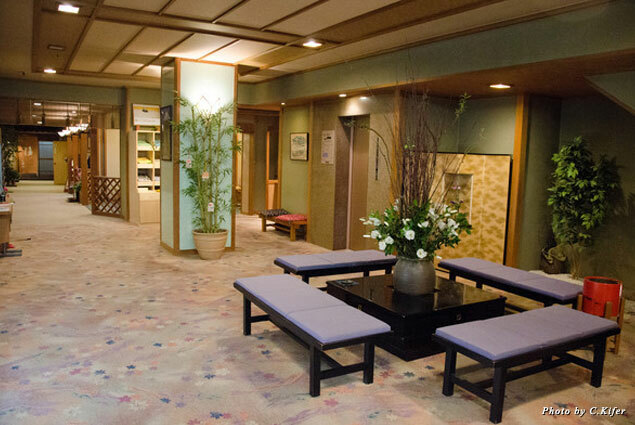 As in many traditional buildings in Japan, when you enter the ryokan lobby, you’ll be asked to remove your shoes and put on a pair of slippers, which you’ll wear in all common areas of the hotel. When you get to your room, leave those slippers outside of your door. 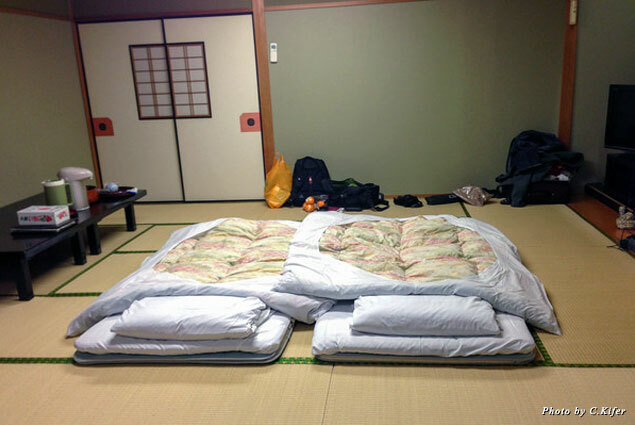 Only touch the tatami mats that line the room with your stocking feet. There will be a second pair of slippers in the bathroom next to the toilet for use in that room only. A low table will be set up in the middle of the room, where you will be served a cup of tea and a snack. Later, this is where you will eat dinner. After dinner, the room’s maid will move the table to the side of the room and set up a plush and pillow-soft futon mattress on which you will sleep. Your room will include a yukata (a cotton, kimono-style robe) for each guest. 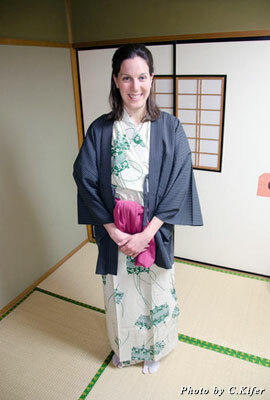 You typically wear the yukata when relaxing in the hotel room, in all communal areas, and even for short excursions outside when you are staying in a hot spring resort area. Wrap the yukata left side over right. Don’t make the same mistake I did and reverse it; right over left is the way robes are tied over corpses! 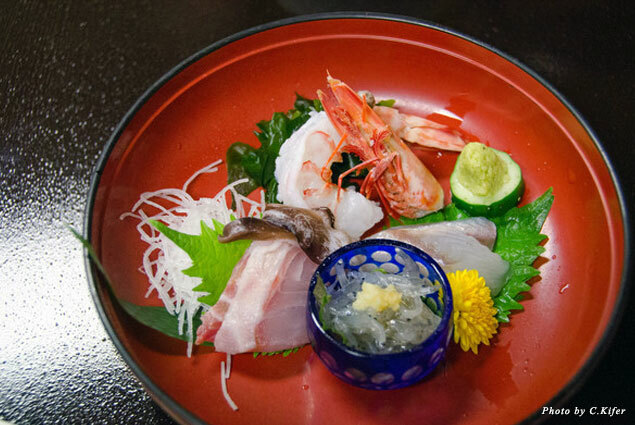 Ryokan’s fixed menu meals are expertly prepared using local dishes and seasonal ingredients. You cannot choose what you eat, but if you call in advance, they may be able to accommodate some dietary restrictions. At the traditional low dining table, you’ll sit on a cushion on a legless chair, either cross-legged or while kneeling. Your room’s attentive and doting maid will serve the meals. While tipping is generally not done in Japan, ryokans are an exception. Do tip your ryokan maid either at the beginning or the end of your stay to show your appreciation for her hospitality. The meal includes a lot of food so do arrive hungry. Leaving a lot of food behind is considered an insult to the chef. 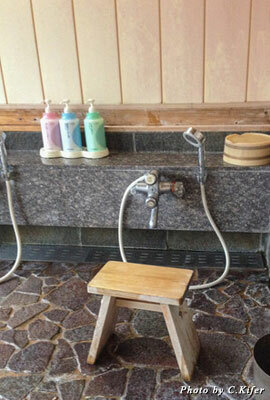 The shared onsen bath is to be used for relaxation, not cleaning. The purity of the water is important, and visitors are instructed to wash themselves well in the adjacent shower area before entering the bath. The shower facilities (typically a row of low, handheld shower heads) are meant to be used while seated on small stools, never while standing up. Rinse off first using the hand shower, lather using the provided soap and shampoo, and rinse yourself thoroughly to remove all traces of soap. You are typically not allowed to wear a swimsuit in the hot spring bath. At check in (along with your robe) you’ll be given a small hand towel, and you may hold that in front of you when you walk from the changing room to the shower and from the shower to the spa. Do not let the towel touch the water. Instead, do as the locals do and drape it over your head. Finally, just as travelers have done for centuries, slip into the water and relax!